It might seem that this steak’s origins hail from Switzerland (at least at first glance), but they do not. It actually comes from the term “Swissing” which means to pound the steak out (much like cube steak). In fact, one of the kinds of meats you can use in this is a cube steak. So it is that we call it “Swiss Steak” although in some places it is simply called “Smothered Steak” (much in the way one makes smothered pork). I use a bladed meat tenderizer which I think is fantastic. All I have to do is place it over the meat and press it down, and the little blades cut into the steak. It reminds me a little bit of the old-fashioned nut choppers that used a bell shaped mincer inside of a jar and a plunger was pressed down onto the nuts. After the steak gets tenderized by the blades, it is then ready to be braised in some sort of sauce or gravy, usually tomato. Along with a few onions and peppers added to the sauce, it is wonderful over mashed potatoes. Or you could put it over cooked egg noodles. It’s very retro and very Heartland. You can use very lean cuts of beef in this too- as they benefit from the Swissing. The plus is that they are also quite inexpensive compared to other steaks. So it was a perfect choice for me when the Sunday Supper bloggers got together this week to do lean beef recipes. It’s pretty heart healthy. And if you like low carb, you can always dish it up over a roasted cauliflower mash. I have subbed those for potatoes many times. Tomorrow I am starting up a new week with a breakfast recipe I am very fond of. Shaksuka. Perhaps you have heard of this or any of the similar type egg recipes cooked in tomato sauce. One of my decisions each January is to reaffirm the need for good breakfast, and I do like eggs. last January I opened up the year with my recipe for Huevos Rancheros. I take pride in each and every new type of egg recipe I master. Trim fat or gristle from steak and pound meat thin with a pronged meat mallet or use a bladed tenderizer. Mix flour, pepper, paprika, Cajun spice and salt in a bowl. Dredge steak pieces in the flour, tapping off excess. Discard any extra flour. Heat the oil in a skillet and brown steak pieces on both sides; set aside. Wipe out pan and add about 1-2 teaspoons oil, then saute the garlic, onions and peppers until they get limp. Stir in the beef broth and tomatoes with juice. Add the meat to the pan; bring to a boil, then cover, reduce heat to low and simmer for about 75-90 minutes. Add water if needed if your pan vents out too much moisture. When the beef is tender, remove the lid, raise the heat and cook until the sauce thickens (if not already- but that depends how much water you did or did not add). If you want a little extra sauce, just add some more broth or water and thicken with a little cornstarch dissolved in water (slurry). Serve steak pieces with vegetables and sauce over mashed potatoes. I love Swiss steak! I usually make mine in the slow cooker, but can’t wait to try your version. This is a perfect dish to make while the weather outside is cold. On my list of things to make next week. 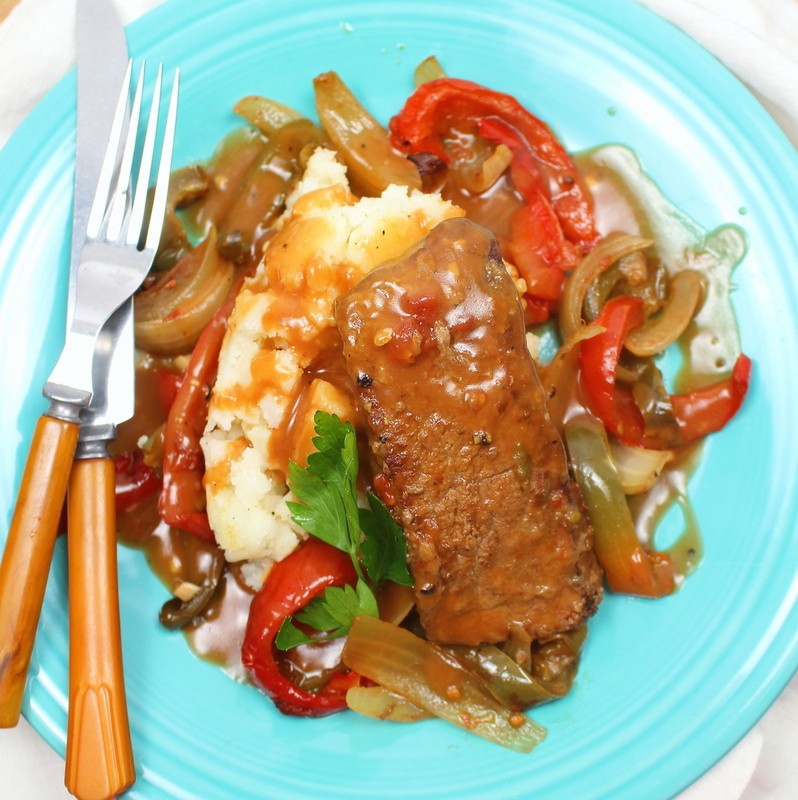 I love Swiss Steak – and it has been way to long since I have enjoyed it. Thanks for the inspiration. I remember eating this as a kid. I need to try it again! Haven’t had this in a long time, looks like I’ve another recipe to put on my make soon list! I haven’t had swiss steak in a long time! This recipe looks so good I need to make it soon. I use a slow cooker for my swiss steak. I love that you use cajun seasoning. I’ll have to try that.